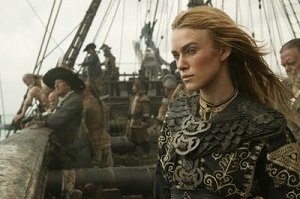 Jack Sparrow, Will Turner, Elizabeth Swann and the others are back for the obligatory third film in the Pirates franchise, and the patchiest of the lot. Where Curse of the Black Pearl failed to impress me (whole lotta pretty visuals), Dead Man’s Chest at least had several great set pieces. At World’s End manages to be somewhere in between those two. The first two hours are horridly boring, with a lot of talking, sailing and backstabbing that is nothing less than tiresome and confusing. Jack Sparrow’s first scene is top notch, and a good example of the surreal comedic talents of director Gore Verbinski, whose best film in my mind is still Mousehunt. After that, however, the representation of Jack’s insanity is disappointingly literal this time around. Whereas Depp’s drunken, effeminate and downright loony performance stunned us all in the first film, here his madness is reduced to miniature Jack Sparrows standing at either ear telling him what to do. The special effects are great, but become tiresome after a while, and two hours in, all I could think about was how unfair it was that Keira Knightley’s character is the only one to have clean teeth. Then, POW! The film shifts gear for the finale and pretty much makes all that came before pretty redundant. The last 45 minutes or so are filled with thrilling swashbuckling moments, but also the most emotionally powerful scenes in the entire franchise. Rather than a collection of set pieces the action stays in one place and just bumps it up a notch every couple of minutes. The meta-narrative is wound up beautifully and one wonders if they could have simply used this act at the end of the second film and saved us all two hours of torture. I read an interview with Verbinski during the filming of the sequels where he admitted that the script was constantly in flux, and this is certainly apparent in At World’s End. The only people involved in the production who seem certain of their aims are the costume and set designers. Everyone else, from the writers to the directors to the actors seems to be more than a little lost. This entry was posted in Film Reviews and tagged Action/Adventure, Fantasy by Stuart Wilson. Bookmark the permalink.